The Aesthera Isolaz laser machine is designed for a variety of cosmetic treatments, but it has earned exceptional praise for the results it can achieve with acne treatment. It is the first cosmetic laser system to be approved by the FDA for the treatment of comedonal and pustular acne. With its pain-free deep pore purification, a used Aesthera Isolaz laser machine will add a new revenue stream to your business. 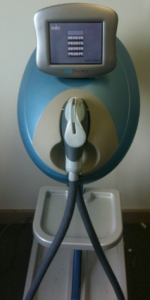 If you are looking for the lowest price on a pre-owned Aesthera Isolaz laser system, you will find it at SunrayLaser.com. We have a complete inventory of quality pre-owned cosmetic laser systems at prices that are up to 60% or more off the retail price. The Aesthera Isolaz laser is easy to operate and extremely patient friendly. This system is completely portable and delivers a wide range of intense pulsed light frequencies from 400 nm up to 1200 nm. The operator can easily adjust the power and delivery time for fast and efficient treatments. SunrayLaser.com has the Aesthera Isolaz laser machine for sale at the lowest price you will find anywhere, and we back it up with a 100% satisfaction guarantee. If you want a no-obligation Aesthera Isolaz laser price quote, simply contact us today using the form below.